Slim Aarons made his career out of what he called "photographing attractive people doing attractive things in attractive places.” Slim Aarons always had a knack for chronicling just the right people in just the right sort of places. A hub for glamour, simplicity and relaxation, The Bahamas was a frequent stop for Slim as it was a perfect canvas for his kind of theatre. With the Bahamas’ “pristine beaches and sunshine, you will find glamorous people.”-India Hicks. The above Slim Aarons’ photograph of The Ocean Club, Paradise Island, The Bahamas hangs in the On Deck Master aboard Yacht Sweet Escape. On Deck Mater stateroom with Slim Aarons’ photograph and Jonathan Adler fabric blinds. Jonathan Adler often incorporates the iconic Slim Aarons in his projects. 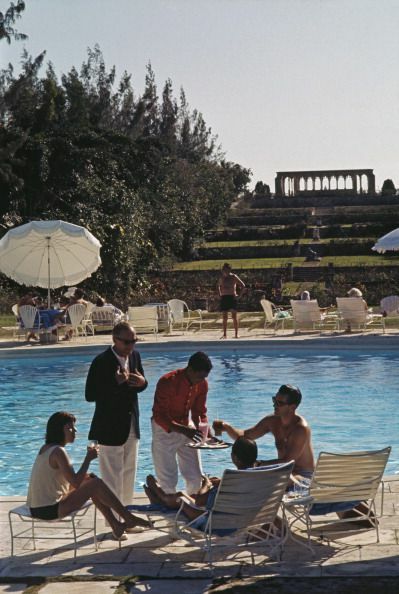 Slim Aarons captured a lifestyle, a moment that can never be reproduced. Slim, who has been called the “photo laureate of the upper classes”, created a visual vocabulary of glamour that spans 60 years – more, if you consider his enduring influence on fashion and modern photography. Slim Aarons was phenomenal at penetrating wasp culture and high society during his time as a photographer of “The High Life”. He made wealth and privilege unapologetic and was capable of producing shots that looked natural; he was able to avoid it looking vulgar or ridiculous. His archives are a treasure-trove of inspiration to designers everywhere. The Ocean Club itself has a history of being the right sort of place and had been a subject of Slim Aarons on different occasions, displaying chronologically its stability as a playground for the rich and famous. It is still popular as a wedding venue for the rich and famous, a retreat for the ultra-wealthy, and is often featured in movies, videos and major sporting events like the LPGA PureSilk golf tournament. The initial start, in the 1930’s, of Hog Island being transformed to Paradise Island was by Axel Wenner-Gren, founder of Electrolux. He oversaw the development of his Shangri La, including his gardens that were inspired by those at the Chateau de Versailles. In 1959, Wenner-Gren sold Shangri La to George Huntington Hartford II, heir to the Great Atlantic and Pacific (A&P) Tea Company. Hartford hired the Palm Beach architect John Volk and built the Ocean Club, Cafe Martinique, Hurricane Hole, the Golf Course, among other island landmarks. There was a fortune spent by Hartford on the build; additionally he invested a substantial amount on the landscaping including the 12th-century Augustinian Cloister. These Cloisters were reported as having been disassembled and shipped piece by piece from France (a romanticized version of events perhaps), as the second version of events is that he acquired and installed them, being from a 14th-century French Augustinian monastery originally purchased in Montréjeau and dismantled by William Randolph Hearst in the 1920s, and having no masterplan they took over a year to reassemble onsite. Despite its constant stream of absolutely fabulous guests, the venture failed to make Hartford money as he was always lending the hotel rooms out or hosting his friends rather than charging them. Hartford eventually received a casino license, shortly thereafter in 1966, Hartford sold the majority of his share of the island. Now a Four Season’s Resort, The Ocean Club has had previously been owned by Merv Griffen, Donald Trump, and Kerzner International, with the Casino and Augustinian Cloister’s still a major attraction on the island.